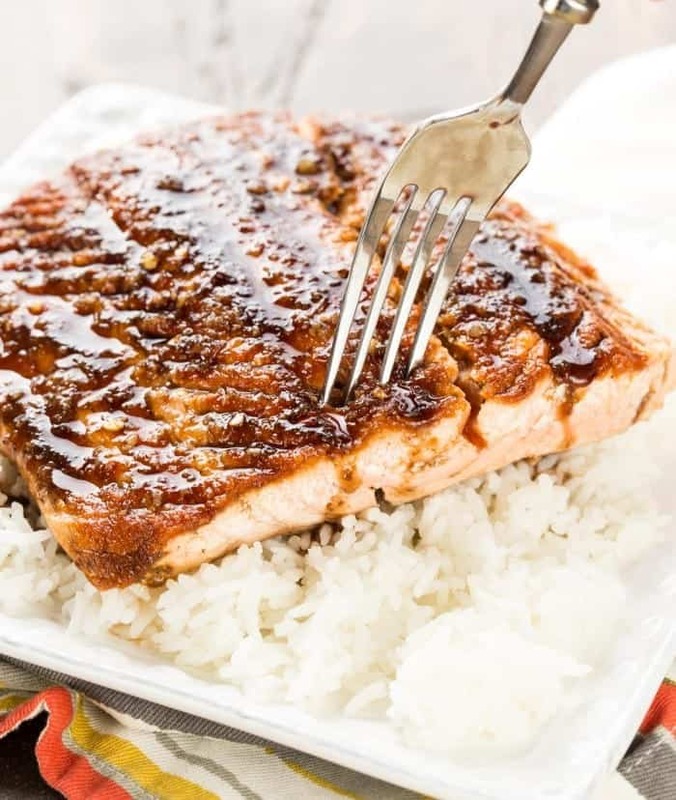 This Maple Ginger Salmon recipe is a family favorite and a tasty way to add more heart healthy fish to your diet! I’m excited to share this salmon recipe with you as it’s one of my family’s favorites. Salmon is one of those wonder foods that we should all eat more of, full of good-for-us nutrients like omega-3 fatty acids. But coming up with new and flavorful ways to entice your family to eat salmon can be tricky, especially with kids. 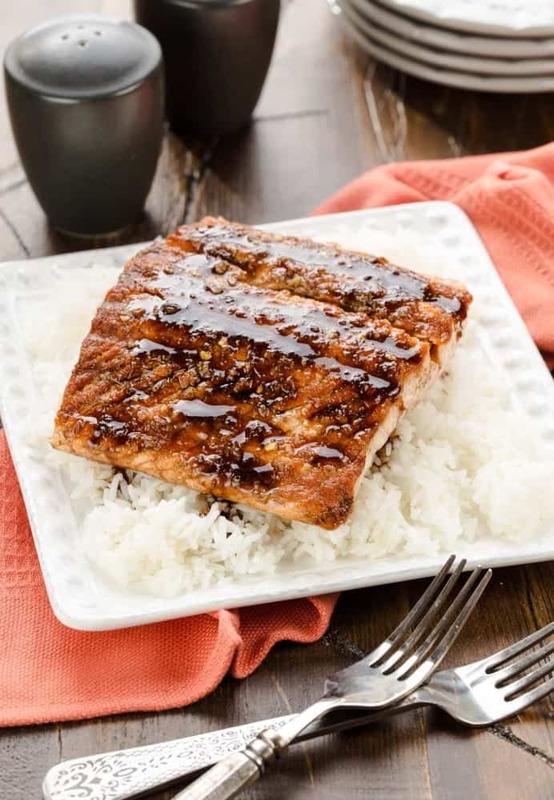 That’s why this Maple Ginger Salmon recipe is a such a hit. The sweet and savory combination of maple syrup, balsamic vinegar, fresh ginger and garlic make the glaze finger-lickin’ good for kids while the dash of hot pepper flakes keeps it interesting for adults. This recipe is simple enough to pull together for a quick week night meal but versatile enough to make an impression when entertaining. Gotta love that! You can prepare it in a variety of ways: throw the salmon on the grill, toss it in a grill pan on the stove or even bake it if you’re so inclined. Personally I’m partial to the higher heat of the grill as the maple ginger glaze caramelizes beautifully. Tip: The glaze makes a ton so set aside half of it when prepping the meal. We love to drizzle the reserved glaze over the cooked salmon when serving. It also makes a great sauce for steamed rice. Mix together maple syrup, balsamic vinegar, ginger, garlic and crushed red pepper flakes in a small bowl. Salt to taste. Reserve half of glaze. Liberally brush both sides of salmon with olive oil. Place salmon on the grill flesh side down. Cook until the salmon starts to loosen from the grates (about 7-8 minutes for a single 3-lb. salmon fillet). Flip the salmon over and gently spoon half of glaze over the cooked salmon. Continue to cook for another few minutes. You want the salmon to flake with a fork but still be a bit opaque in the middle. It will continue to cook when you pull it off the heat. Hi Brooke, thanks for your comment. Drop us a line when you make the meal and let us know what you think! made this last night, baked instead of grilled because we don’t have a grill, and it was PHENOMENAL. Maple and ginger together. so great. Hi Tim, it’s a great combo of flavors, isn’t it? I’m thrilled you enjoyed it. Thanks so much for taking the time to leave a comment! What an awesome way to dress up salmon on the grill! We made a large wild sockeye fillet and this glaze made it extra special! Thanks, D. I knew you’d love it! I attempted this on the grill, and the grill read 400f and it took well over 20 minutes. Just Incase others also had the same issue. Came back from Vermont where I had salmon with maple ginger glaze in a restaurant and wanted to try making it at home. Used pan searing instead of grill because it was freezing outside. This recipe was a big hit! Hi Lynn, pan-searing is the only way to go in this cold, snowy weather. So glad you enjoyed it! It’s definitely one of our favorites.